There is a left moving cell approaching Gayndah right now and another right mover north that just split in the last 30-40 minutes. Looks like some interesting weather for that region. Not so sure if Brisbane will cop it again. On another note storms are also firing on the south coast near the upper trough. I would think that there is a chance of severe storms if the atmosphere there is dynamic enough as there is not much cape. 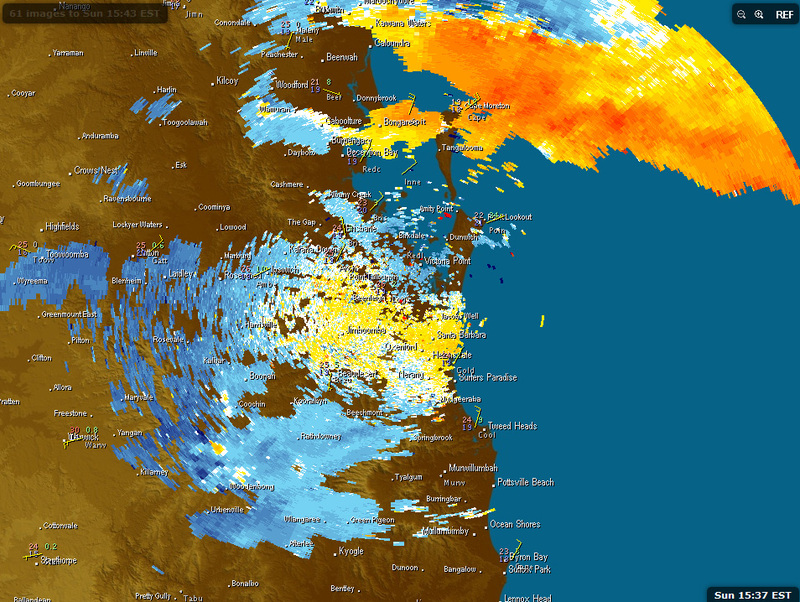 Interesting new cell coming into Qld over the border ranges. Cheers from NSW ;-)! Incredible footage – thanks form posting Michael Bath. Your fears and predictions on the phone Jeff Brislane were spot on! 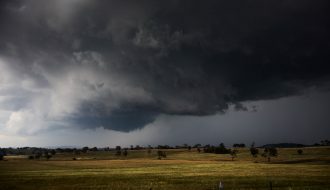 Given the rush to get back to Sydney and I guess the model’s forecast for storms to be over early, the split left and right mover that spun off the left moving monster was the only ones we could intercept. (18Z data though seemed to point towards perhaps a slightly later persistence in the lower level wind shear environment). 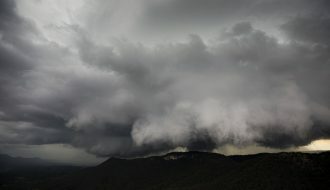 I wished we did not have the constraint of getting back to Sydney as it was so easy for us to get down to Boonah for that particular storm. This was the target. In the end an improvement from the day prior but an additional insult haha. Earlier in the day, we watched some earlier development but the lack of heating was apparent and they weakened. Suddenly whilst in a back road, we heard thunder. We realised that we were near the right mover split. We quickly took off and from here – we did not stop! We ventured in from of the right mover as it neared Ipswich. On the freeway, I had limited opportunities in photographing the whole structure so unfortunately, the photographs do not do the storms justice. The photograph below show the classic split in progress ie a split from a right moving split! The left mover and other pics follow. Lesson learned I hope! We had no map and this contributed to the failures – I keep forgetting that Queensland is a larger state and so the scale differs. Left mover from the split. I shot a barrage of pictures just to get one! 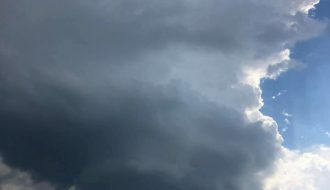 Earlier this was part of the weakening storms. One thing I have overlooked was our driver for the trip Colin Bryant. He got to experience the demands and intensity of a chase and he did well! Let alone the marathon trip home arriving from Brisbane at 3:15am to allow me to get to work that morning! Well done and welcome to long distance storm chasing. I felt I let you down but there will be other opportunities. Yes there were some funny moments. I guess we have to see when the next system will affect us. 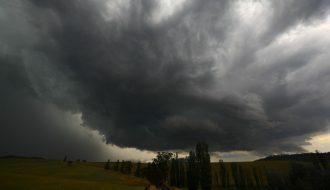 Got slammed by the right mover near Biggenden on Sunday. Had hail to around 4 cm at our location with a few branches coming down as well. 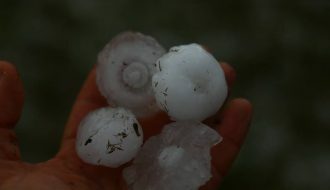 Further up the road the hail was much larger; the largest hail stone being ~8.4 cm around an hour after it fell. The wind damge was impressive too with quite a few large trees down (including over the road). 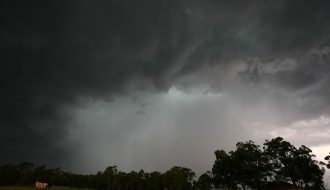 Later we intercepted another storm out towards Preston. 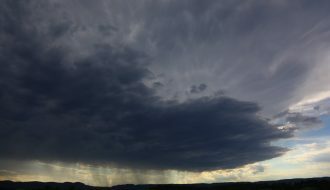 Quite a photogenic storm, after the storm passed us we found small hail drafts with hail to ~3 cm. Topped off the day with lightning around sunset. Great intercept and pictures Michael Thomas and Colin Bryant. Thomas do you have pictures of the structure please? Or were there too many trees? Thomas do you have pictures of the structure please? Or were there too many trees? Love the picture of the hailstone! Does anyone have pictures of the storm that passed to the north of Brisbane earlier in the day? Hi Jimmy, we approached the storm from the east on a tree-lined road. I barely even saw the storm. We did catch a glimpse of the base which looked great, after that we were in heavy rain then large hail. Could of been quite dangerous had we been further down the road. I do have photos of the left mover near Proston. Very photogenic Thomas! Well done.